Muchas gracias por tomarse el tiempo de escribir una opinión sobre nuestro Restaurante. Estamos contentos de poder leer que pasó una velada muy agradable. Good service, excelent food. Worth to try! Ask for window table, they have nice views of the garden. Thank you very much for taking the time to write a message about Restaurante Jardín del Alma. We are glad to read you had a nice meal with us and that our service was at the level expected. Muchas gracias por tomarse el tiempo de dejar su comentario sobre nuestro restaurante Jardín del Alma. the quality of the food is not in line wirh rhe price for barcelona. main issue is that the dishes are not savourous enough. it is only ok. Thank you very much for taking the time to write a message about Restaurante Jardín del Alma. We work with seasonal and best quality products in order to provide dishes respecting the essence of the ingredients. We are sorry it was not of your taste. The food was OK, not exceptional, the flavours were just slightly dull, The meat was good, the suggested wine ok. Service good and atmosphere very good, in the garden and inside with a warm sophisticated living feel. Thank you very much for taking the time to write a message about Restaurante Jardín del Alma. We are happy to read you liked our atmosphere and service. Muchas gracias por tomarse el tiempo de dejar un comentario sobre nuestro Restaurante. Nos orgullece poder leer que tanto nuestras instalaciones como el menú propuesto fueron de su agrado. Outstanding service and food. The desserts are the best part but is difficult to get to that point without being already full. Garden setting is lovely. It’s been a great experience having dinner here. We got a nice meal deal thanks to the “restaurant week” special offer. We loved all dishes. The red wine was a good pick as well. One of our waiters Georgi was so nice and helpful, giving us all the useful advise and customized service. It was a pity due to the rainy weather we couldn’t have a table outside. But the garden is undoubtedly a hidden treasure! Would definitely go back! 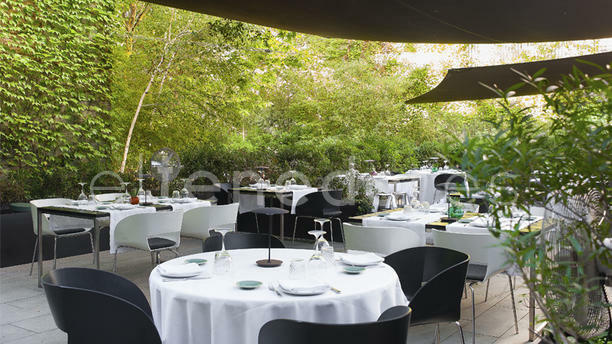 The garden is beautiful, spacious and with a lot of space in between tables. The dinner was delicious, freshly made, and well put together. Now the drinks in the garden make no sense at all. 12€ for an Aperol is a pure joke. Atencio 10/10, muy rico y tranquilo. Muy top! Excellent and silent in a Garden in the center of Barcelona. I would recomend corvina for a fish and the menú degustación is very good and good price.